19-May, 2015 (Tuesday) Fruit Twilight Meeting, Clarkdale Fruit Farms, 303 Upper Rd., Deerfield, MA. 5:30 PM. Light dinner will be served. 1 pesticide re-certification credit. 20-May, 2015 (Wednesday) Fruit Twilight Meeting, Tougas Family Farm, 234 Ball St., Northboro, MA. 5:30 PM.Light dinner will be served. 1 pesticide re-certification credit. It's getting hard to stay caught up. Fortunately insect activity is at a minimum, however, tarnished plant bug and European apple sawfly are active or will be active soon. A pink insecticide spray directed at these pests is not a bad idea if you are concerned about them. Oriental fruit moth should be flying any day now, so pheromone traps to monitor and establish a biofix should be hung in the orchard ASAP. We predict McIntosh full bloom will be sometime between Sunday, May 10 and Thursday, May 14. Apple scab: we just scraped by this morning with no infection period, although a period of showers first thing this morning resulted in several hours of leaf wetness. Still, no infection period. At Belchertown, we have had only one scab infection period to date, that was April 20-21. If the forecast is correct, the next one, and it will be a BIG one, is forecast for next Monday-Tuesday, May 11-12. Of course your mileage will vary depending on whether you get wet between now and then. BUT, based on ascospore maturity and following the models, only ONE fungicide, and that was a green tip copper spray, would have been necessary to cover apple scab to date (in Belchertown, MA). Fire blight: the sky is falling, the sky is falling! Is it really? It depends, however, the risk is clearly elevated (to extreme) for later this week depending on when you have open bloom. Things to keep in mind: you must have open bloom to get blossom blight, however, heat before (and during bloom) will elevate the bacteria population; you need wetting, including dew or sprayer (and of course rain) to get fire blight infection. That is really it: open bloom, plus heat, plus wetting = fire blight infection = need to apply streptomycin to open bloom. Streptomycin must be applied within 24 hours of the wetting event (before or after) to work. Both apples and pears are susceptible to fire blight. Don't fool around with this. If you have any questions, let us know. And make sure you read the Diseases section by Dan Cooley et. al. and Guest Article form Cornell. You should have all the management information you need now to handle fire blight this year! Oh yea, did I mention that stone fruit (peach, cherry, plum) in bloom need a brown rot fungicide (Bravo, Captan, Indar, Merivon, Sulfur, etc. etc.) when we have wetting. Bloom is an underlooked but important time to nip brown rot in the bud (no pun intended). Finally, it is getting dry. Water should go on by the end of the week, particularly on droughty sites and young trees on dwarf rootstocks (and especially on newly planted trees). We don't really know what the effect of lack of water has on bloom and fruit set, but I would not take any chances. • Note that there is a mistake (at least one) in the 2015 Guide; it says Syllit FL at 2 pints per acre, but label is 1.5 pint per acre, the label is the law and must be followed. This week’s tests of apple scab ascopspore maturity showed that there are plenty of spores that will be released with the next wetting period. We are getting good spore release in our tests (see details below). 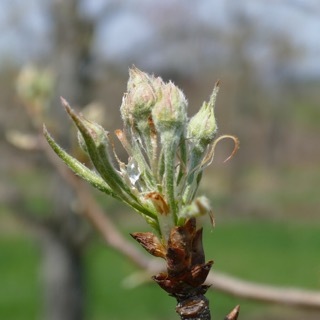 At UMass Cold Spring Orchard (CSO), that wetting period happened this morning, May 5. Whether leaves stay wet for long enough is a question, but it is warm and the sun is out. While infections have been predicted over the past two weeks, none have materialized. In reality, a copper application at green tip would have handled any infections we’ve had at CSO to this point. Today, May 5, the various predictions differ in predicting scab infections over the next week. NEWA predicts no infection at CSO through May 10, as far as it reaches out. Similarly, RIMpro predicts nothing until May 11-12, when it predicts a huge infection period. Ag-Radar and SkyBit both predict scab infection on May 10 and 11. So, either Sunday or Monday of next week will be the beginning of a potentially major scab infection period. This will coincide with bloom, and be complicated by the fact that streptomycin sprays will probably be needed for fire blight (see below). During pink, bloom and petal fall, in addition to scab and fire blight, it is also a good idea to consider spraying for powdery mildew, particularly with the long stretch of dry weather this spring. Be aware that captan sprays at this time can interact with surfactants such as Regulaid, or the formulation used in Fontelis, and be taken into plant tissue where it can cause damage. For this reason captan should not be applied within a week of sprays containing Regulaid or Fontelis. Check Healthy Fruit Apr 7 for a description of the different methods we are using to examine ascospore maturity. On 5/4/15, we ran a petri plate assay with cut sections of 6 scabby leaves from the same outdoor collection for 2 hours and then examined the 2 slides. RESULTS: A total of 31 ascospores were seen during the examination of 20 microscope fields at 200 X magnification. We did not pull the microscope slide from the outdoor 2-fan spore trap because there had not been a significant rain event since the last examination. On 5/4/15 we brought in a fresh batch of scabby leaves from the outdoor collection of scabby leaves (Belchertown). We wetted the leaves and placed them in the indoor funnel spores trap for 20 min. RESULTS: 61 ascospores were seen. This is a big increase from last week (last week we saw a few spores). On 5/4/15 we also performed squash mounts on 10 overwintered fruiting structures (pseudothecia) plucked from 6 leaves to evaluate maturation of ascal sacs and the spores they contain. RESULTS: all 10 pseudothecia had some ascal sacs that contained mature ascospores. The percentage of mature ascal sacs (versus immature) rose from 85 % last week to 90 %. In preparing this procedure, the “squashing” of the pseudothecia caused many of these sacs to rupture, releasing spores into the drop of water. It is doubtful that these spores would have released on their own, without the wetting. However, many more spores were seen around the pseudothecia than were seen last week. We will attempt to do the 2 lab tests each week, early in the week, until primary scab season is over. The spore-trapping test will be run at intervals that will depend on the rainfall in Belchertown where the scabby leaf collection resides under squares of hardware cloth near the weather station. This season is shaping up to look as bad as last year in terms of fire blight. Very high risk of infection is predicted as trees come into bloom late this week and into next. Bacterial populations will be high, as reflected in Maryblyt’s estimates of the Epiphytic Infection Potential, EIP for Cold Spring Orchard, CSO, in Belchertown using Weather Underground predictions for temperature and rain. Figure 1. Figure 1. 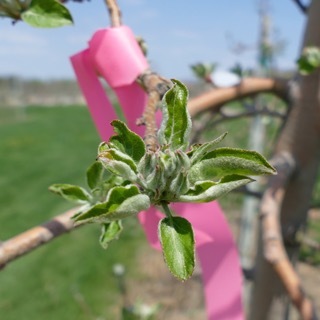 MaryBlyt output predicting fire blight risk at Cold Spring Orchard, Belchertown, MA with bloom predicted as May 9. Risk is presented under the column “BHWTR” (don’t worry about what it means). The relative risk is color-coded: Yellow means Moderate; Orange means High; Red means Infection. Values of EIP over 100 during bloom represent a high risk. As EIP values reach 300, there’s a significant risk of infection in larger trees and relatively tolerant varieties. As the chart from MaryBlyt below shows, with predicted bloom on Saturday, EIP values are very near 100, near 200 on Sunday and over 250 on Monday. There is a low risk of showers Sat. and Sun., increasing on Mon. and Tues. Any rain at all will trigger a definite infection. In eastern MA, where temperatures have run slightly warmer and bloom is predicted to be earlier, the risk of fire blight is more severe. For example, fire blight risk in Stow, MA is predicted to start on May 8 with 5 consecutive days of possible infection (Figure 3). Figure 3. MaryBlyt output predicting fire blight risk Stow, MA, with bloom predicted as May 7. More infection days occur with the earlier bloom, and EIP levels are higher than in western MA. Similarly, Ag-Radar is showing high to extreme risk of fire blight on May 10, 11 and 12 in its CougarBlight model (Figure 4). NEWA is showing extreme risk beginning Friday May 8, but this is in large part because NEWA set bloom at May 4 for CSO, which definitely is not the case, and it cannot be reset to the more likely May 9. In short, NEWA is significantly overestimating risk because it “thinks” trees at CSO are in bloom. Figure 4. 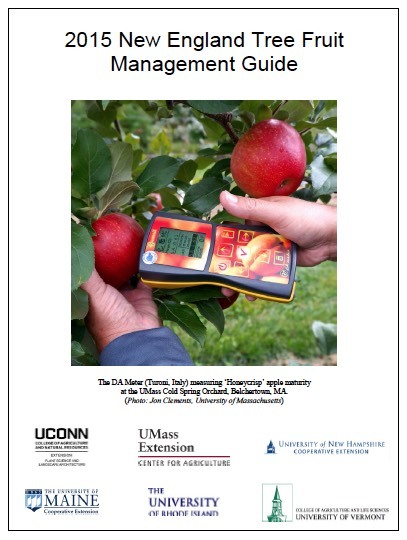 Ag-Radar output predicting fire blight risk at Cold Spring Orchard, Belchertown, MA. High to extreme risk is predicted for three days starting May 10. The MaryBlyt prediction for Stow is extended to 5 days. The EIP reaches very nearly 300, a severe infection risk. The bottom line is that the risk for infection is very high in all of southern New England this year, and growers should plan to spray streptomycin, perhaps multiple applications. NY pathologists are recommending application of streptomycin even without rain when the EIP exceeds 100. Given the widespread occurrence of fire blight last year, and the high populations of fire blight bacteria this year, we agree. It may mean that 2 to 4 applications of streptomycin will be needed during bloom, but based on experience last year the early application could make the difference between no infection and a significant outbreak. In the MaryBlyt predictions for CSO below (Figure 2), two applications of streptomycin, one on May 9 and another on May 11 suppress blight risk Sunday through Tuesday, the days with definite infections in the forecast. EIP is kept below 100. It would be important to spray all trees with open blossoms, even those that have not gotten fire blight in the past, in order to keep them uninfected, and to prevent them from being a reservoir for the bacteria. Figure 2. 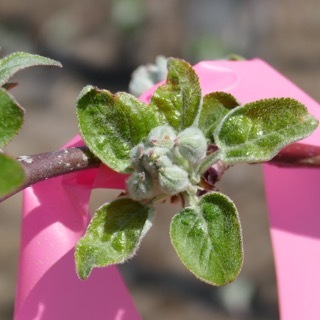 MaryBlyt output predicting fire blight risk at Cold Spring Orchard, Belchertown, MA, with two streptomycin applications, one Sat. May 9, the other Mon. May 11. No infection days occur. While streptomycin may be concentrated in low volume sprays, Regulaid should be mixed based on the actual water volume. For example, if a sprayer holds 300 gal, and the spray rate is 50 gal/acre, at a rate of 12 oz/A streptomycin, put 60 oz of streptomycin in the tank with 3 pt of Regulaid. When risk of fire blight remains high for several days during bloom it may be necessary to reapply streptomycin within two or three days of the first application because a significant number of new flowers open. In some cases, a third or fourth application may be required. If a second, third or fourth application are needed, use streptomycin alone at the 24 oz/A rate without Regulaid to minimize phytotoxicity. For maximum uptake, apply streptomycin when drying is slow. Evening or night applications are good, as light also breaks down streptomycin. Apply 8 to 16 oz. of formulated streptomycin (24 to 48 oz./acre) plus 1 pint of Regulaid per 100 gal in the first spray. If you have small trees and calculate tree row volume, do not drop below 12 oz. streptomycin product per acre. If no Regulaid is added, the minimum rate of streptomycin should be 24 ounces/A. Nothing this week, sorry...concentrate on managing fire blight. Consider applying Apogee during late blom to petal fall to control shoot growth and reduce the risk of fire blight infection of shoots. Last season, fire blight was unusually severe throughout NY and the rest of the Northeastern United States. Moreover, there were many odd tree decline scenarios in 2014, such as a case in Vermont where fire blight ooze was found at silver tip along with other situations where fire blight was associated with stem borers, winter injury, and herbicide damage in scenarios that were impossible to tease apart. Impacts of last season's damage are still being felt in the form of dead or dying trees in the spring of 2015. 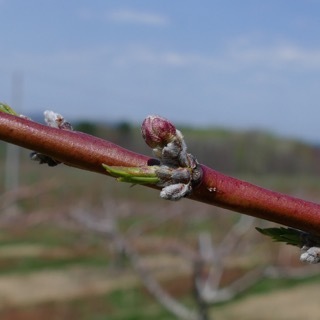 These situations cause considerable trepidation as apples in eastern NY and southern New England move into bloom this week, a week during which hot weather, oozing cankers from last year, and the predicted rains could create another year of severe fire blight if flowers are not protected from infection. 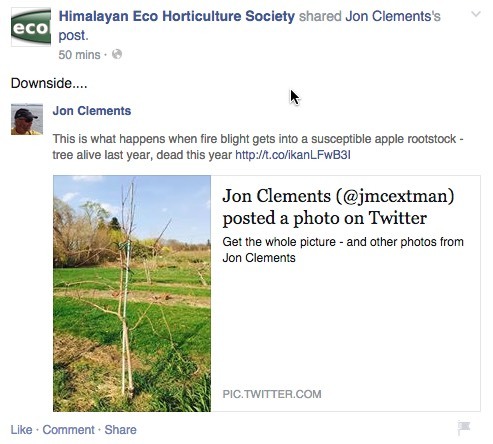 Last year, some growers in the Hudson Valley and New England applied streptomycin sprays only to young plantings and high-risk cultivars, on the assumption that older orchards of cultivars such as McIntosh, Golden Delicious, and Empire were not very susceptible, and therefore did not warrant protection. Furthermore, the strep sprays were applied only after a string of warm days that allowed an accumulation of high epiphytic infection potential (EIP) because we assumed that sprays were not needed so long as there was no rain, dew, or other source of moisture to move bacteria from the stigmas to the infection sites at the bases of the flowers. On many of those farms, the strep sprays were very effective in protecting trees to which it was applied, but older trees that had not been protected developed significant amounts of fire blight. As the season progressed, the blight sometimes moved from these older infected trees back into young trees, where shoot blight infections caused additional damage. In retrospect, it appears that delaying the first spray until rain or wetting was predicted allowed too much time for the bacteria to be disseminated in high numbers to older blocks, which generally might have escaped infection if weather favorable for blight had been of a shorter duration. In the Hudson Valley, this year is shaping up to be a repeat of last year: Weather forecasts are indicating at least a week of very warm weather (highs in the upper 70s and low 80s) as apples are coming into bloom. Some areas may get rain on Tuesday, but other areas may not have any rain or may not yet have trees in bloom on Tuesday. After that, no rain is forecast until next Sunday. If no strep is applied until the end of the week, that would once again allow plenty of time for wide dissemination of fire blight bacteria prior to the first strep application. To prevent a recurrence of last year's problems, we suggest two specific strategies that should be implemented this year. First, highly susceptible blocks should be sprayed with strep as soon as the EIP exceeds 100 even if no rain or dew has occurred. (This would be Wednesday or Thursday in the lower Hudson Valley.) This approach will eliminate inoculum in the middle of the bloom period rather than allowing it to multiply on flower stigmas and be disseminated without restraint, as will occur if strep applications are delayed until late in the week. Second, when rain finally is predicted after multiple days of warm weather (70 to 80°F), ALL orchards should be treated with strep within 24 hours prior to the rain, rather than focusing treatment only on blocks considered "highly susceptible", because even older trees of less susceptible cultivars will get blight if temperatures remain high for many days during bloom. Thus, we are suggesting a pre-emptive strep application on high-risk blocks after EIP exceeds 100, followed by the usual strep application timing ahead of any subsequent rain(s), with the latter applied to ALL orchards. Where orchards cannot all be covered ahead of rains, strep can be applied within 24 hours after the rain. Although the specter of streptomycin resistance in western and central NY seems to have disappeared for the moment, the fire blight season can still be very difficult to control if weather favors the pathogen. In this regard, we have continued to refine and update our guidelines for managing fire blight in NY, with an emphasis on young plantings and the registration of Kasumin 2L in the winter of 2015. Kasugamycin is another aminoglycoside antibiotic like streptomycin, and while it doesn't have local systemic activity, it is an effective alternative antibiotic to streptomycin, and provides excellent blossom blight control. We will be continuing to screen fire blight samples for streptomycin-resistant Erwinia amylovora in 2015. Information on submitting samples is outlined at the end of the guidelines, but detailed sample submission instructions will be posted in a later issue of Scaffolds. Ed. note: Kasumin 2L only needs to be used where streptomycin-resistant fire blight is documented. To that end, we in New England also currently have a project being run by Quan Zeng at the Connecticut Agricultural Experiment Station (Dan Cooley here at UMass is a collaborator) to collect active fire blight blossom and shoot blight samples (if there are any) from New England orchards this year. Thus, if you suspect you have an active fire blight infection, and are seeing symptoms of fire blight (blossom or shoot blight), please let us (Jon Clements or Dan Cooley) know ASAP about it so we can collect a sample, and then we will send it to Quan for resistance testing. This effort is being funded by the Northeast IPM Center. Below, we present our guidelines for managing fire blight. The guidelines are broken up into four sections: guidelines for production regions where streptomycin resistance has never been detected, chemical management guidelines for high risk regions where streptomycin resistance has been detected, guidelines for new plantings, and guidelines for on-farm nursery production. Ed. note: I am only re-printing here the GUIDELINES FOR PRODUCTION REGIONS WHERE STREPTOMYCIN RESISTANCE HAS NEVER BEEN DETECTED because to our knowledge, we don't have any resistance here (yet) in New England. All fire blight cankers should be removed during winter pruning. Remove all trees with central leader or main trunk infections. Infected wood should be removed from the orchard and either burned or placed where it will dry out rapidly. Copper sprays should have been applied at green tip. Processing varieties can be protected with copper as late as 1/2-inch green, depending on requirements of the label. When blossom infection is forecast, apply at least 24 oz/acre of streptomycin alone. If there are concerns about the effectiveness of streptomycin, submit a sample for testing and follow the guidelines for regions where streptomycin resistance has been confirmed. We suggest including Regulaid (1 pt/100 gal of spray solution) in the first spray, especially if it is applied under rapid drying conditions. Regulaid can be omitted from subsequent applications so as to minimize the leaf yellowing that is sometimes associated with repeated applications of strep. Prohexadione-Calcium (Apogee) applications [6–12 oz/100 gal (3–6 oz/100 gal for tree <5 years)] for shoot blight should be seriously considered, especially on highly susceptible varieties when apple trees have 1–3 inches of shoot growth, typically late bloom. A second treatment should be made 14–21 days later. This is a preventive treatment and will not be effective if you wait until you see signs of infection. Fire blight strikes should be pruned out promptly and destroyed. It is best to prune well back into healthy wood, at least 12 inches behind the water soaking margin, or into 2nd year wood. If severe blossom blight occurs where strep was applied in a timely manner, contact CCE for SR Ea testing, listed under "Sample Submission" below. (In New England, see Ed. note) No quarantine will be imposed if SR Ea is found in your orchard because strep-resistant fire blight is not a regulated pathogen. 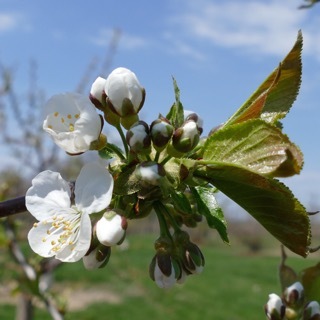 If you need to interplant apple trees in existing orchards where fire blight was observed, wait until late fall, so the bloom on the new trees will be synchronized with the established trees. If possible, plant varieties grafted on fire blight-resistant rootstocks. Trees should be carefully examined for fire blight infections before planting. Infected trees should be discarded. Samples should be submitted for strep resistance testing. Contact CCE for SR Ea testing, listed under "Sample Submission" below. Immediately after planting, and 14 days later, a copper application should be made using the lower copper rates that are labeled for use after green tip. Ensure that soil has settled to avoid phytotoxicity to roots. Trees should be scouted at 7-day intervals for fire blight strikes until July 31. Infected trees should be removed as described above. Plantings also need to be scouted 7–10 days after hail or severe summer storms. The NEWA disease forecasting model for fire blight can assist by providing an estimate of symptom emergence following a storm or other trauma event. Also scout the planting at the end of the season (mid-September). If possible, remove flowers before they open. New plantings may have considerable numbers of flowers the first year, and blossom removal may not be practical. If this practice is followed, the blossoms should be removed during dry weather and before a lot of heat units have been accumulated and there is a high risk of fire blight infection. Trees should receive an application of copper at a stage equivalent to bloom. Observe the labeled REI before blossom removal. To protect any remaining bloom, follow the chemical management program for your regions of streptomycin resistance risk. Samples of any infections observed after planting should be submitted for strep resistance testing; see contact information below (in New England, see Ed. note). Infected trees should be removed entirely in these high density orchards. Ed. note: you can also check out our updated recommendations for fire blight control in the latest issue of Fruit Notes. The next Healthy Fruit will be published on Tuesday, May 12 or thereabouts, 2015. As always feel free to get in touch with any member of the UMass Fruit Team (http://extension.umass.edu/fruitadvisor/team-members) if you have questions or comments.